Semi-desert, foothills, montane. Shrublands, woodlands, meadows. Spring, summer. Above and left: Mike and Mona's Five Springs Farm, May 26, 2016. 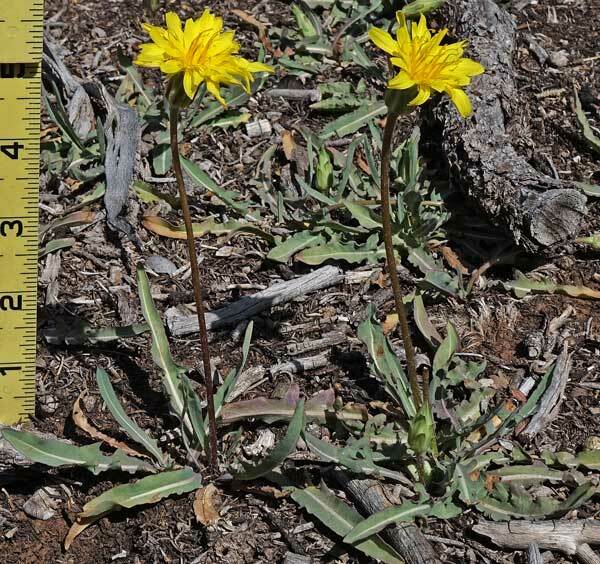 2) It is 10-25 cm tall versus 10-50 cm tall. 3) Its leaves are most often lobed vs. entire. 4) It is typically in more xeric habitats. The plant often forms such apomictic (asexual) colonies as shown at the top of this page. Welsh, who considers this taxon to be A. glauca var. 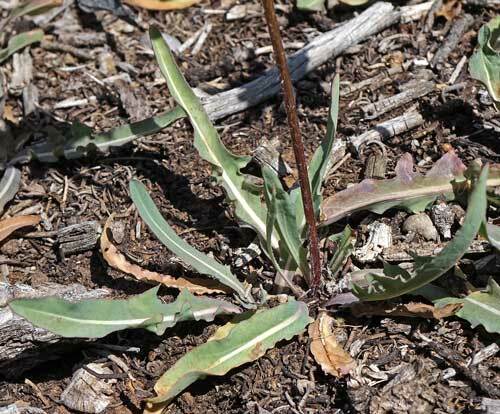 laciniata, indicates that this is the most common Agoseris in Utah. 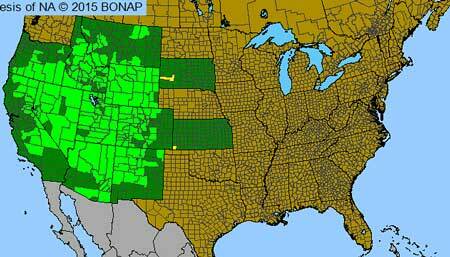 As the map below indicates, A. parviflora is found in most counties of most western states. Pursh named this plant Troximon glaucum from a specimen collected in 1811 by Thomas Nuttall on the banks of the Missouri. Rafinesque placed the species in the Agoseris genus in 1833 and the plant has endured numerous name changes since then. 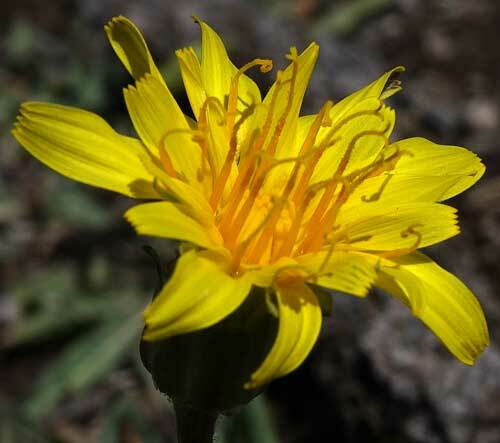 "Agoseris", a genus name given by Rafinesque in 1819, is Greek for "goat chicory". "Parviflora" is Latin for "small flower", which is quite a misnomer. Thanks for the assistance Carolyn. Mike and Mona's Five Springs Farm, May 26, 2016. Flower heads are made up of ray flowers. Phyllaries are in 2-3 overlapping series and the tips are just slightly reflexed. The flowering stem, the peduncle, is often glabrous, but may have scattered hairs toward the upper end, as you can see in the second photograph at left . 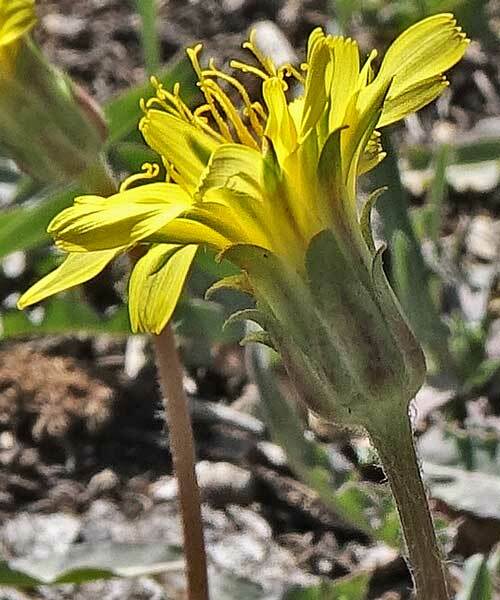 The basal leaves of Agoseris parviflora are usually lobed and the lobes are often retrorse (bent back), but the leaves may be entire, even on the same plant that has lobed leaves. The leaf surface is commonly glabrous and glaucous, as shown at left, but may be quite hairy.